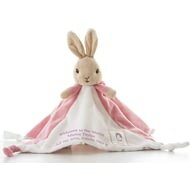 From the classic Beatrix Potter books this beautiful Flopsy Comforter is made from premium soft plush to ensure he is as gentle against babies skin as can be. 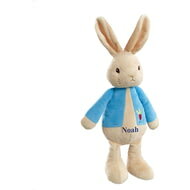 From the classic Beatrix Potter books this beautiful Peter Rabbit Comforter is made from premium soft plush to ensure he is as gentle against babies skin as can be. 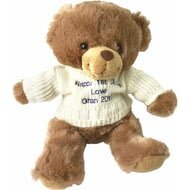 This little fellow comes with his own knitted cream jumper which is expertly embroidered with your message for the recipient. Give someone special a Valentine keepsake that will be treasured long into the future. This little fellow comes with his own knitted red jumper which is expertly embroidered with your message for the recipient. 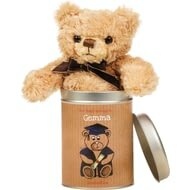 Show that you are proud of your graduate with this huggable gift in its own personalised tin. 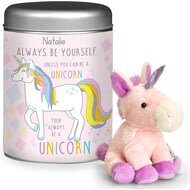 This 18cm high tin can be personalised with your sentiment for your graduate. 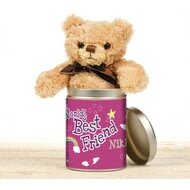 For a Birthday, Christmas or even just to show how much you appreciate her, this Best Friend Teddy in a tin is the perfect way to say what you need to. 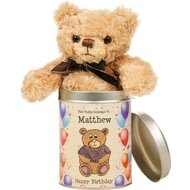 At 15cm high, this cuddly bear can be carried with them or it can be kept safe at home in their own personalised silver-coloured tin. This cute 18cm high, soft cloth teddy with its appealing, shiny eyes and ribbon scarf is a lovely keepsake christening present for a little boy. This cute 18cm high, soft cloth teddy with its appealing, shiny eyes and ribbon scarf is a lovely keepsake christening present for a little girl. Give someone special a Birthday keepsake that will be treasured long into the future. Give someone special a keepsake that will be treasured long into the future. 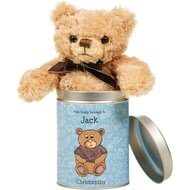 Make Mum smile with this little bear from her little Angel. This cute 18cm high, soft cloth teddy with its appealing, shiny eyes and ribbon scarf is a lovely keepsake Christmas present for a little one.